THE BATTLE FOR BURNSIDE IS ON! She rides a cool motorcycle, swings a mean right hook, and has backup from the best crime-fighters in the biz, but Batgirl’s greatest weapon has always been her mind. As the brilliant Barbara Gordon, she’s on the verge of a tech breakthrough that could transform her beloved Burnside neighborhood, and all of Gotham City to boot—though if it falls into the wrong hands, it could just as easily devastate them. But how can Batgirl stop a hacker who can break into her brain itself? A sinister figure has been haunting Batgirl’s nightmares and stealing all her secrets, from her high-tech innovations to her hidden identity. And he’ll use that knowledge to destroy her forever. It all comes down to this! 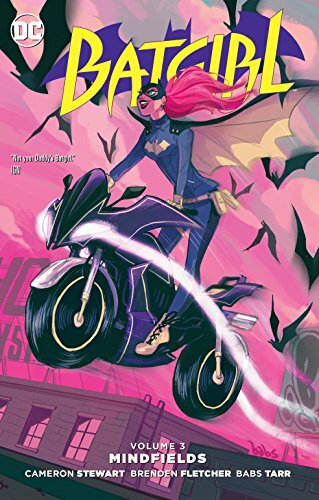 The revolutionary creative team of Cameron Stewart, Brenden Fletcher, and Babs Tarr bring the saga of the Batgirl of Burnside to a close in BATGIRL VOL. 3: MINDFIELDS. Be there for the shocking climax to one of the greatest Batgirl stories ever told!